High quality outdoor wall lights with wonderful features can enhance the look of your outdoor areas. These lights are very efficient in spreading lighting around your outdoor areas. Decorative wall lights are often used for the security purpose in garden or front area of your house. The solid finishing of the lights are the ideal choice for home or professional places. There are important features to take into consideration when choosing an outdoor wall light. When choosing an outdoor wall light, one should first look what the purpose will be. Will it be installed in a partially covered area or shall it have to face all kinds of weather? Important is to check the IP degree of the light. This is the international protection marking and will indicate how much a light can be exposed to dust and humidity. IP shows 2 numbers : the first number will indicate the degree of protection against dust, hhe second number will indicate the degree of protection against humidity. The higher the number, the more protected a wall lamp will be. Of course, it’s not always easy to obtain the right degree for the chosen lamp. Sometimes, style wants to prevail on protection but if this is the case, you should pay attention that the fixture can be shielded someway. Also, it’s not because the water cannot touch the fixture that it won’t be subject to rust symptoms. Of course, this can also harm your wall light. There are no fixed prescriptions because every situation is different but in practice, an IP degree of 64 or 65 is a minimum. Other features about for outdoor wall lights are the beam and luminosity. The beam of an outdoor wall light is everything for creating the right atmosphere. Most of the time, the luminosity is less important because the light effect with the beam is primordial. In the case of ascending or descending outdoor wall lights, the power will mostly vary from 1 to 6W (in one orientation). With the beam, you can determine the effect of the light reflection. Most of all this plays a role with ascending or descending outdoor wall lights. Choosing for a wide beam will more have an enlightening effect of your house where a small beam will emphasize more on details. A beam can also form a shape, for instance the creation of stripes or triangles. Or, you can sometimes choose to have an ascending beam and not a descending, or both. Nowadays, there are already outdoor wall lights available where you can adjust the beam. 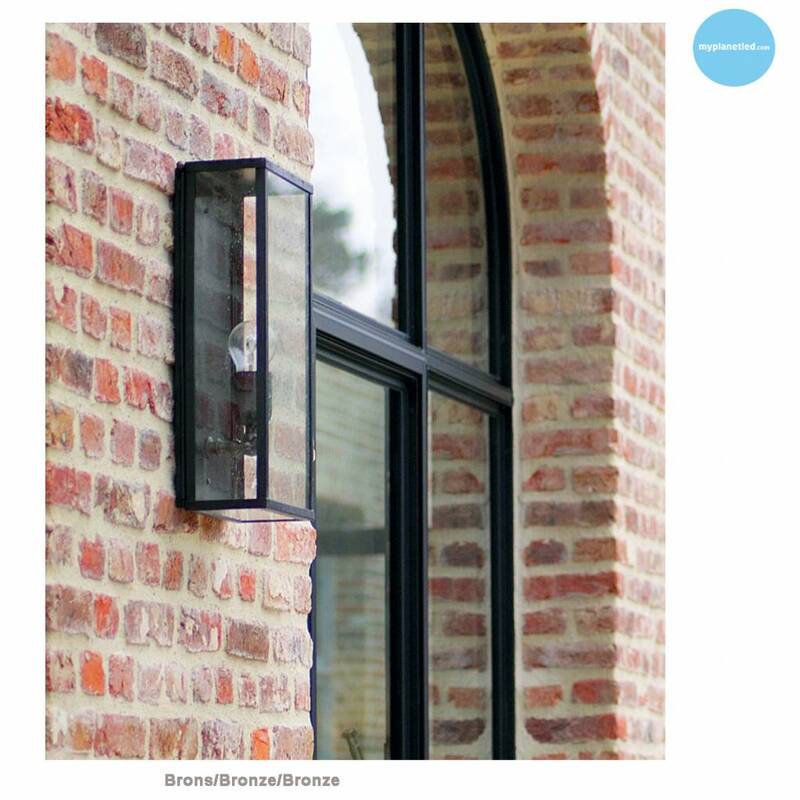 When choosing frontal an outdoor wall light, you can choose for a built-in or a built-up solution. Built-in is the most aesthetic one but demands a lot of preparation : you need to prepare the integration of the fixture in the wall and therefore, you will have to grind away a part of the wall and you will need to foresee the power cables in the wall. Another kind of frontal outdoor wall light is the built-up lantern. This is the kind of lamp that can be equipped with a pole or just with a lantern. The light is well-spreaded around thanks to the plexi or glass cover around the lamp. It can have a lamp shade in the shape of a hat. The material used can be wood, plastic or metal. 3) Orientable or not orientable? An outdoor wall light can be practical if it’s orientable. After all, it allows to orient the light exactly where it’s necessary. In addition, you can avoid a lot of hood and break work if you don’t have a connection at a particular place. Nowadays, there are a lot of orientable outdoor wall lights available. However, always ask yourself the question in which case it’s necessary to have them orientable. If you only want a descending and ascending light, it’s less important. Style and shape should correspond to the house style. Choose a design outdoor wall light for a modern house. Don’t try to mix up different styles. Choose a classic style (for instance a lantern or a discrete lamp) for a classic house. Sometimes, styles can be mixed (for example a modern style with a mansion) but if you hesitate, call us for free advice.